Long before the construction of Highway 89A, a wagon road ran between Flagstaff and Sedona. The original builders found a path of least resistance from the elevated rim down through a steep valley, and it just happened to go to some of Sedona's most iconic rock formations--the charismatic towers that crown Schnebly Hill. Old Schnebly Hill road has since been bypassed, but not abandoned. Today the rocky double track makes for a long downhill cruise from I-17 to downtown Sedona. The ride is fairly easy, but optionally connects with some even more thrilling and difficult trails. Schnebly Hill is the proud, toothy ridgeline at the mouth of Oak Creek Canyon, north of Sedona. It is named for Carl Schnebly, an early entrepreneur in Red Rock Country The road also bears his name because he used it to transport goods between towns. It is still open to vehicles, but only passable with high clearance. Although Jeep tours frequently rumble up this road, it is plenty wide to share and still go fast. If traveling from I-17 to Sedona, the ride is mostly downhill. To avoid the return uphill, leave a car at the parking area along the paved end of Schnebly Hill Road, then drive the lengthy shuttle (see directions below). Exciting single track is near the road’s lower end. Munds Wagon Trail parallels the road, but the adjacent Hangover Trail climbs Schnebly Hill and takes you to entirely different terrain. Hangover Trail could be named facetiously for the numerous rock overhangs that it ducks beneath. It traverses rock slabs, hugs cliffs, and offers amazing views of Oak Creek Canyon. Cowpies Trail, a bit further up Schnebly Hill Road, winds through juniper forest and bounces over rocks to connect with Hangover Trail. Among these three routes, there are lots of options for rides around Schnebly Hill. 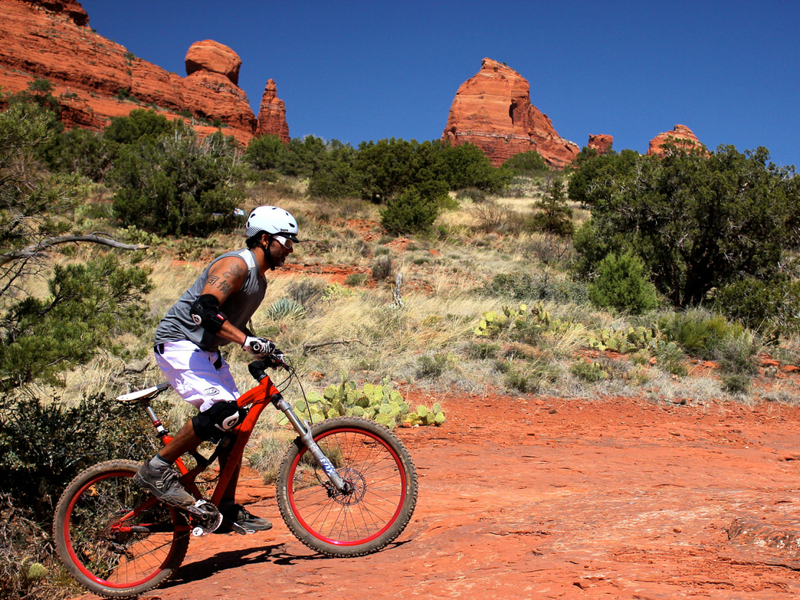 For a long, leisurely ride, take Schnebly Hill Road from I-17 to Sedona. For a full day and much more challenge, pedal the road back up. Experienced riders can add on the Hangover Trail. If you venture onto this trail, don’t hesitate to walk your bike when necessary. The full loop with Hangover, Cowpies, and Munds Wagon is 8.2 miles. Some determined riders even take on the 30-mile “Triple H” loop that combines Hangover with the Hiline and High on the Hog trails by connecting through town. To reach the lower end of Schnebly Hill Road from Flagstaff, take AZ-89A S to Sedona, then go left at the first roundabout for AZ-179 S. At the next roundabout, go left on Schnebly Hill Rd. After 1 mile, pavement ends and the parking lot is on the left. A $5 Red Rock Pass or Interagency Pass must be displayed on your dash to park here, but there is no self-pay station for the Red Rock Pass. Get it at the Oak Creek Visitor Center or at a different trailhead’s self-pay station. The top of Schnebly Hill Road is at Exit 320 off I-17, where parking is free. To set car shuttle for the downhill ride, you will have to leave a car at the trailhead parking. Return to 179 S and continue all the way to I-17, then go north to Exit 320. It is nearly 40 miles of driving in between, but saves a grueling uphill ride.